There's a salty science to Taco Bell's mad-Mexican-ery: combine two things you haven't combined before, inject some sort of cheese, and then give the Frankenstein-ito a portmanteau name that evokes the sound of oozing. Case in point: the Tex-Mex joint's alleged latest addition, the Quesalupa. Brand Eating reports the newest cheesy creation is slated for a February release nationwide, consisting of a "Chalupa-like shell but with a melted cheese core." Because hell if you can't get more cheese into a Chalupa. 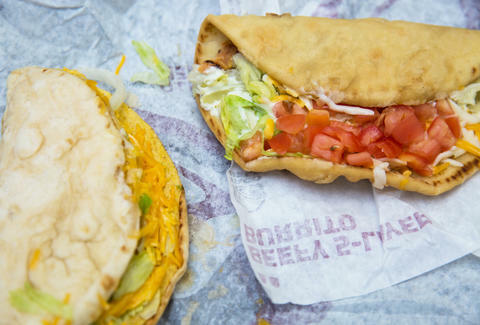 The item previously went on a test run in Toledo, OH Taco Bells, and its return was alluded to in advertising. Comment from discussion Tasted the Quesalupa.